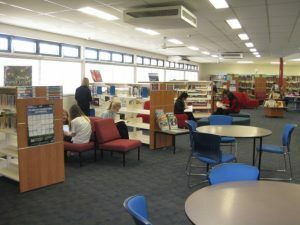 At Yarra Hills Secondary College, the Libraries aim to empower all students with the knowledge and skills to become life-long learners, be confident and independent seekers of information and encourage a passion for reading. 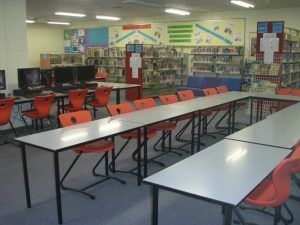 The Libraries strive to engage students with their learning and encourage reading for enjoyment through various activities working with classes or with groups of students. We always welcome any suggestions or feedback on the services the Libraries provide. The College has a Library at each of its campuses. The Mooroolbark branch caters for all students from Year 7 to Year 12 (VCE and VCAL) and the Mount Evelyn branch catering for students from Year 7 to Year 10. In providing a service to all students and staff, the Libraries are available to all and they are welcomed and supported in a vibrant, comfortable and well-resourced environment by friendly and helpful Library professionals. The libraries have dedicated areas for private study, research and reading. The libraries offers a number of resources available to students including fiction and non-fiction books, magazines and newspapers, games, the Internet (via Wi-Fi or the Library computers) and a printer. Also the Library staff in both campuses is available to assist students and teachers with their research and reading requirements.